I meant to read Everything I Never Told You ages ago but I think I had read too many novels about family secrets and suburbia at the time and kept putting it off for later. 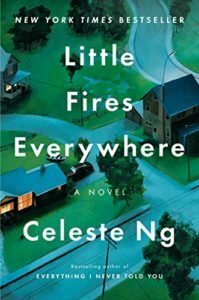 I always meant to get around to it, but with the whole Reese Witherspoon book club and optioning of Little Fires Everywhere, I decided to start with Ng’s follow up. The novel, set in 1998, begins in early summer in suburban Shaker Heights, outside Cleveland, Ohio. Ng hints at previous neighborhood drama involving interracial adoption, and Mrs. Richardson’s disagreements with her tenants, but the morning the narrative starts, the big drama of the day (and new future gossip) is the fire at the Richardson home, apparent arson set by the youngest daughter, freshmen Izzie. From here, Ng takes the reader back to the end of the previous summer, when Maya, a photographer, and her teenage daughter, Pearl, move into Mrs. Richardson’s rental property. After living a rather nomadic life, Maya wants to give her brilliant daughter a chance at stability in a good high school. Moody, the Richardson child in the same class as Pearl, develops a friendship with Pearl, and eventually, the lives of the two families intertwine very closely, with Pearl developing friendships with eldest daughter Lexie, and junior Trip, while Izzie, the misunderstood youngest daughter, is drawn to Maya’s different life style. Mrs. Richardson feels like a rather traditional white, middle class progressive. While she believes that she has the right attitudes and is open to other life styles and cultures, when it actually affects her own life (or those closest to her), she ends up being more conservative. She feels slightly threatened by Maya, and yet condescending towards her, even offering Maya a job as her housekeeper in a moment of “charity.” While the differences between Maya’s bohemian life style and the Richardson’s stable suburban life style already causes some tensions, it is a separate issue involving friends of the respective women that leads to greater complications, and little fires everywhere at the end of the school year. Ng makes her characters sympathetic, even as she reveals their flaws, and show the mistakes they make throughout the year. It would be easy to see Lexie as the popular one, Trip as the jock, Moody as the nerd and Izzie as the rebel, but Ng humanizes the characters. While Mrs. Richardson’s journey is also rather familiar (progressive who is more progressive in theory than action), even she felt very human, and if not entirely sympathetic, her choices made sense. The case that is the turning point for the novel felt very ripped from the headlines, and reminiscent of stories that I vaguely remember being in the news in mid ‘90s so I appreciated that nod. While many of the aspects of these stories could have been set any time, there was something about the novel that felt like it needed to be in the ‘90s, and I felt true to the time, from the lack of cell phones to the spaghetti straps. Can’t wait to see what Reese does with this one! Share the post "Little Boxes on the hillside, Little Boxes all the same"